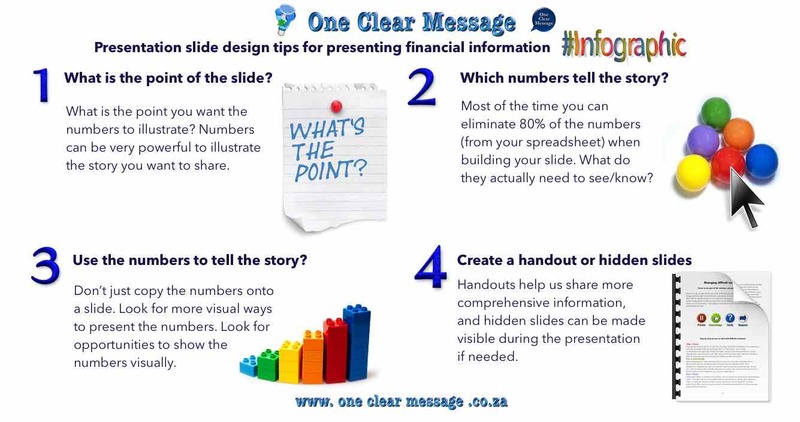 When you need to present specific financial information (whether the budget for next year, a report or an update on current projects) don’t just copy your spreadsheet and paste it into your slide. Spreadsheets in a presentation can overwhelm the audience with too much information and leave them confused. Always keep your slides simple. 1. What is the point of the slide? Start by clearly defining what your message is. What is the point you want to deliver to your audience? Numbers can be very powerful to illustrate the story you want to share. Create a headline for your slide that shares this story (idea/message). 2. Which numbers tell the story? What does your audience actually need to see? Now that you know the story you are trying to tell, which numbers (out of all available in the spreadsheet) tell your story or make your point? Most of the time you can eliminate 80% of the numbers (from your spreadsheet) when building your slide. Be clear on the message you are trying to deliver in your slide design e.g. If you are discussing the difference between project A and B, don’t select all the numbers, pick those that tell your story. Compare the % difference in key areas between the projects. What does the audience need to see? 3. Paint a number picture to tell the story? Don’t just copy the numbers on to a slide. Look for more visual ways to present the numbers e.g. as in Slide design tips: Percentages and statistics. If you are comparing values, perhaps a simple table or graph would show the difference better. When showing the trend of data, a line graph may work best. When showing a % difference, a summary table with arrows indicating whether the difference is positive or negative shows the key information effectively. Look for opportunities to show the numbers visually. Handouts enable us to share more comprehensive information with our audience without overwhelming them with cluttered slides. Part of good preparation is anticipating possible questions, but a more effective approach is to create hidden slides or or a handout with additional information to answer these questions. Hidden slides are not visible during the Slide Show mode, but can be made visible during the presentation if needed. If you really want to get your presentations right, consider hiring a professional presentation consultant to help. A professional can help you get perspective about what’s important, help you protect your brand and deliver clear powerful visuals which augment your message. If you need help with your Presentation skills and Financial slide design contact us today.